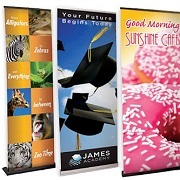 Stand out at your next trade show or event with retractable banners from Signarama! Signarama of Huntington offers several banner stand models in both standard and economy categories to suit your needs and wallet. Our retractable banner stands are an easy, cost-effective promotional solution. Typically most of these stands are made for indoor use, but could be used outside for short terms. Our economy line of retractable banner stands are a low-cost alternative to our standard roll up banner stands. Signarama's economy models are functional and reliable, but use lighter weight materials and simpler construction to save you money. Two economy models are available to fit your needs and your budget: our single-sided model measures 31 inches wide and 77.5 inches tall, while our double-sided retractable banner is 32.75 inches wide and 78.25 inches tall. Signarama can provide full digital printing for your banner display stand. Another great benefit of the Retractable Banner Stand is when you need to change to a different design you can replace the design without having to buy a second banner stand. Just bring your existing Retractable Banner Stand to your local Signarama and have our team of designers make you a new banner to use with the existing stand. If you find yourself in a jam, and have an upcoming trade show booth that is missing a display, give Signarama call and we will work to provide you with a sign in time for your trade show. Signarama finds that many business customers can benefit from having a Retractable Banner Stand as part of their marketing supplies. Easily have your message at any event for all your customers to see. Compared to other display products the Retractable Banner stand is the easiest to use, quickest to set up and take down, and simplest to store.